Bread is an integral part of everyday life around this home. This bread used for toast is enough to get me started in the morning but you can’t forget all of its’ other important uses; sandwiches, topping a casserole, seasoned bread crutons, crumbs to thicken sauces, for dipping, the list goes on. It’s been some time since we actually purchased a loaf of bread from the grocery store and unfortunately when we do it often goes to waste. We are spoiled by the amazing homemade loaves Matt churns out every few days and it has made it impossible to go back to even the best baked bread you find at the grocery store. While, Matt is extremely modest about his bread making abilities, I am here to confess that despite it keeps him up far too late on work nights, I can not live without it. He makes the process look effortless, patting and kneading the dough with ease and assures me it becomes second nature with practice. Below outlines his method. Left out are the countless hours spent waiting and folding and getting the correct rhythm but I assure you if you are at all motived to give it a whirl (more than one attempt) you will not be disappointed with the results. In fact, I’m fairly confident (like us) you will never want to go back to buying bread. The directions will depend on your time schedule. Ideally, the night before you plan to bake the bread you will make the leaven by combining 200g room temperature water (preferably filtered), 100g white bread flour, 100g whole wheat flour and 1 tablespoon of the sourdough starter…find recipe for starter here. 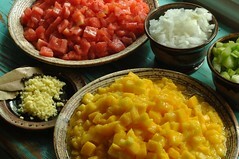 Stir until all ingredients are hydrated, then ferment overnight in a medium size bowl. In the morning, mix your dough. Combine 700g room temperature water with 200g of leaven, stir until hydrated. To this mixture add 100g whole wheat flour and 900g white bread flour. Mix until all the flour is well hydrated. Turn this mixture out onto the counter. Let rest for 20 minutes. After the time is up add 20g of salt, this is also the time to add 3/4 cup of sunflower seeds (optional). Combine ingredients well using your hands. 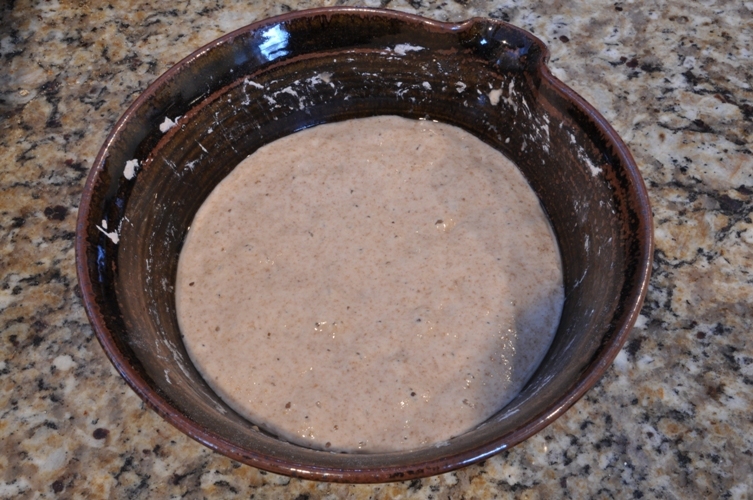 Turn the dough into a round shape and cover with a large bowl. You can also leave the dough in the mixing bowl. For the next 4 hours stretch and fold the dough at 30 minute intervals. To do this on the counter pull the dough towards you and then fold back to the middle, next to the right side, then left, and finally the side furthest from you. As you bring that last fold in pull it right over the dough to create a ball with surface tension. After the 4 hour time period you will shape the loaves. 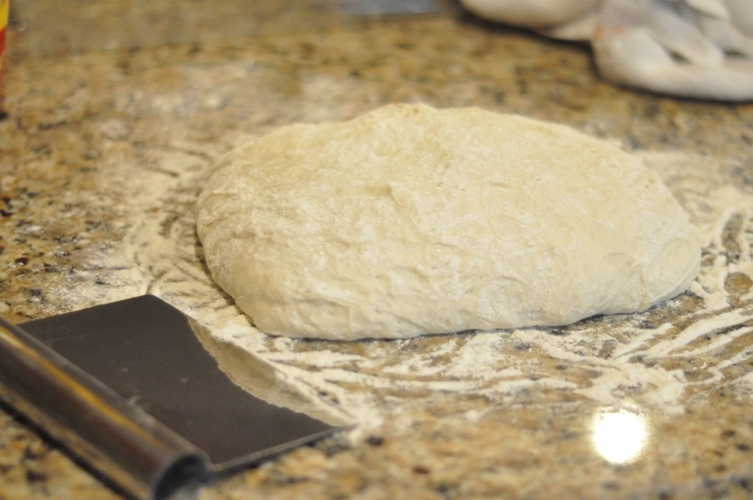 Divide the dough in half using a bench knife, shape each half into a round, cover, and let rest for 20 minutes. 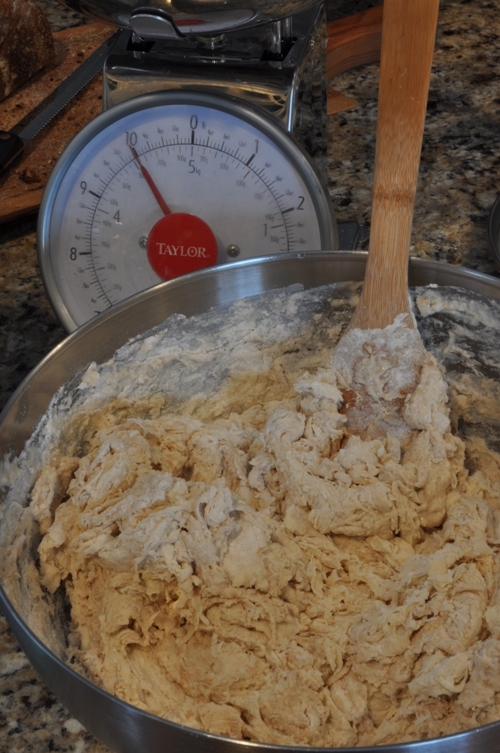 Next shape the loaves using the stretch and fold method but this time finish be stretching the fold nearest you back over the remaining dough, then using your bench knife turn and tuck the dough to create a firm round with good surface tension. Line 2 large bowls with towels dusted with a 50/50 blend of wheat and rice flour. Place the loaves in the bowls seam side up, cover and let rise for 4 to 5 hours at room temperature (75 degrees farenheiht). Note: air temperature greatly affects the rate of rise. The cooler the temperature the slower the final rise. We use proofing baskets with liners from Brotform. Place a cast iron combo cooker in the oven and preheat to 500F half an hour before baking. Turn the loaves seam side down into the pan, score the loaves, place the lid on and place in the oven. Reduce the temperature to 450F and bake for 20 minutes. After the time is up, remove the lid and bake for an additional 20 to 30 minutes until the crust is burnished. Remove the loaves to a rack and let cool for at least an hour before slicing. This bread is involved and takes practice. 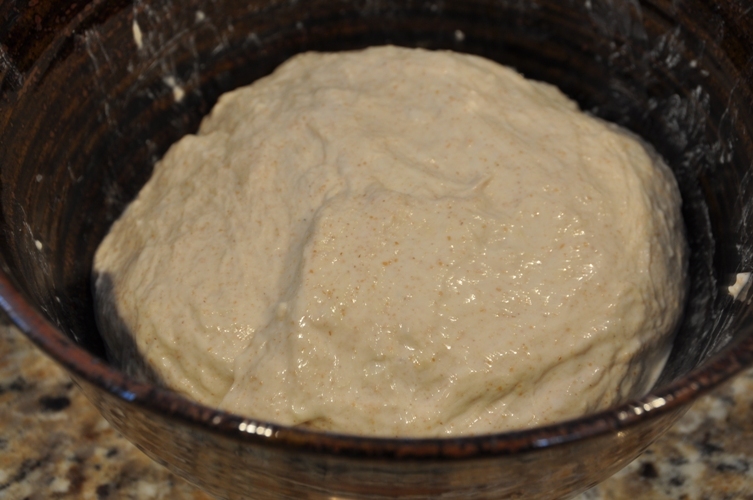 After a couple of times you will get a feel for the loaves and be able to churn out very good results every time. 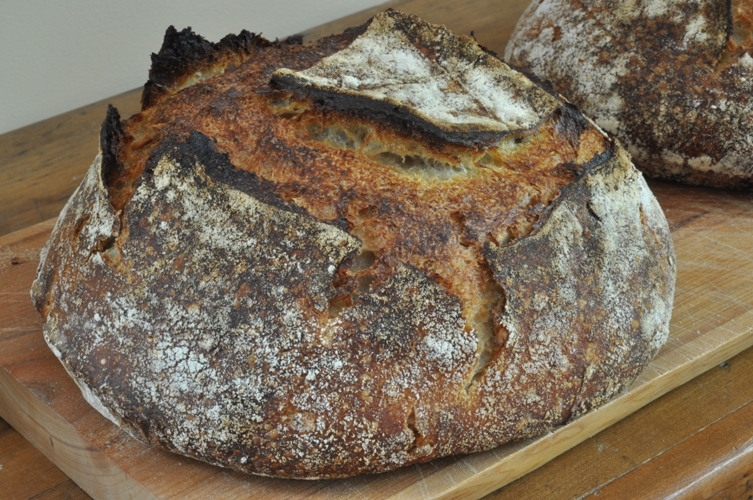 I recommend getting the book Tartine Bread by Chad Robertson as that is where this recipe hails from. The book also goes into more detail and has some great instructional photos as well as excellent recipes and variations on the regular country loaf. Also, I insist you get the cast iron combo cooker from Lodge . Baking in cast iron has been a revelation for me, allowing me to achieve professional results in my household oven. Again, this recipe may seem daunting but you won’t be long getting a feel for it. For a little extra inspiration watch Chad make it all look so easy in this video. Oh no….I was with you til the combo cooker from Lodge. My husband is on a strict no more cast iron order until we purchase our own home with adequate storage space. His grill/griddle already lives in the oven when not in use. Love the idea of making bread in cast iron though. It looks like it gives it a nice crust. that is one beautiful loaf. 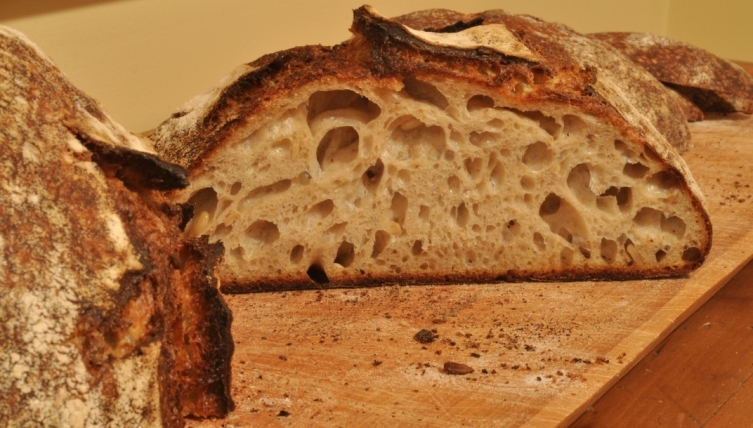 The crumb is gorgeous!